Mrs. W's fifty question test with key for William Shakespeare's Romeo and Juliet. PLEASE SEE THE PREVIEW FOR A VIEW OF THE TEST. Includes: a variety of question types about play excerpts (included on the test), content, AND includes an answer key. 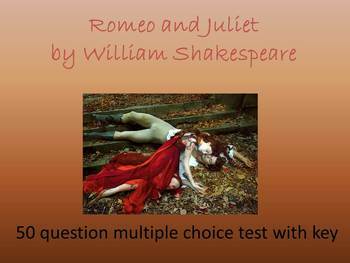 This test is designed to work with any version of William Shakespeare's Romeo and Juliet.